A confluence of factors has put OT networks online and more susceptible to cyber attacks. Without addressing threats targeting the OT network, any manufacturing facility, industrial operation or critical infrastructure can be ground zero to a devastating attack. 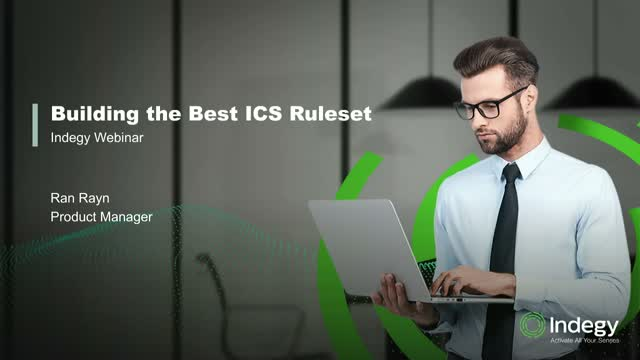 When tasked with creating the rule sets that are optimized for ICS environments, security experts must take into consideration a number of key areas. Modern day industrial operations often span complex IT (information technology) and OT (operational technology) infrastructures. A confluence of trends has caused all the right conditions for the perfect and potentially devastating security event. This session will immerse you in this rapidly evolving topic and provide you with the expertise to weather the next category 5 cyber storm. In the high stakes game of industrial cyber security, which powers will you need to defend your organization. Will you choose player 1 or player 2. A confluence of trends has caused the security of industrial operations to take center stage in the C-Suite. The convergence of IT and OT environments, migration of once isolated OT environments to IIoT, and of course increased targeting of industrial networks just to name a few. With these emerging trends, there is an even greater need to have 100% visibility, security and control across industrial environments. One of the key design decisions needed when implementing an industrial cyber security solution is the approach best suited for your industrial control environment - passive, active or hybrid. Join us for our next webcast where Mille Gandelsman, CTO and co-founder of Indegy will explain what “active” security is, what it does, why you need it, how it is safe and how to get there. Learn from Indegy's experience of implementing active technology for the past four years in some of the most demanding and sensitive environments globally, and gain the field knowledge needed to secure your industrial operations both now and into the future. When it comes to security, network only monitoring leaves organizations open to significant risk and threats. Learn more about the proven technology that is achieves complete security across the most demanding OT environments. Recent studies indicate that the biggest threat to OT security is those already have access, namely the Insider Threat. This session will discuss the three most common forms of insider security threats, how they are carried out and the risks they pose to OT environments. We will discuss best practices for preventing, detecting and limiting the impact of insider threats on operations. We will cover risk assessment, visibility and how leveraging OT Asset Inventory can help to combat the Insider Threat. When it comes to critical infrastructure protection, there’s no shortage of cyber fear-mongering. Some of is warranted, while a fair amount is exaggeration and vendor market-speak. How much of the cyber talk around infrastructure attacks is hype, hysteria and hyperbole? Will nations use cyber weapons in the next war and what are the possible impacts? Could they be as devastating as some experts predict? In the OT world, security was never a concern because it was air-gapped and isolated from the rest of the world. Today however, IIoT is the effective and efficient way to go; but it is not without risk. Join us for this session where we will discuss how hackers can get into your environment given the new operating paradigm and how to stop them before they cause damage. Designed years ago before the cyber threat existed, Industrial Control Systems (ICSs) were designed for operational reliability but they lack the security needed to thwart today's threats. Join us for this exciting webcast that will help you understand the latest when it comes to industrial cyber security and how to protect your organization. Modern day industrial operations often span complex IT (information technology) and OT (operational technology) infrastructures. In a very standard environment, thousands of devices exist and are increasingly being connected via the Industrial Internet of Things (IIoT). This creates new challenges in securing industrial environments specifically by making cyber-security threats even more difficult to detect, investigate and remediate. Why are industrial controllers amongst the most important assets to protect in ICS Networks? Industrial control systems are at the heart of every infrastructure. Learn about the steps needed to secure them. Indegy, the leader in industrial cyber security, protects Industrial networks against cyber threats, malicious insiders and human error, by providing visibility and control. We offer the most advanced Industrial Cyber Security Suite, leveraging a hybrid of policy-based monitoring and networks anomaly detection, with unique device integrity checks for full visibility into ICS activities and threats.